Gut-Eating Amoeba Caught On Film : Shots - Health News Dangerous and impolite: This little guy triggers food poisoning in people by biting off chunks of intestine, chewing on them for a bit ... and then spitting them out. 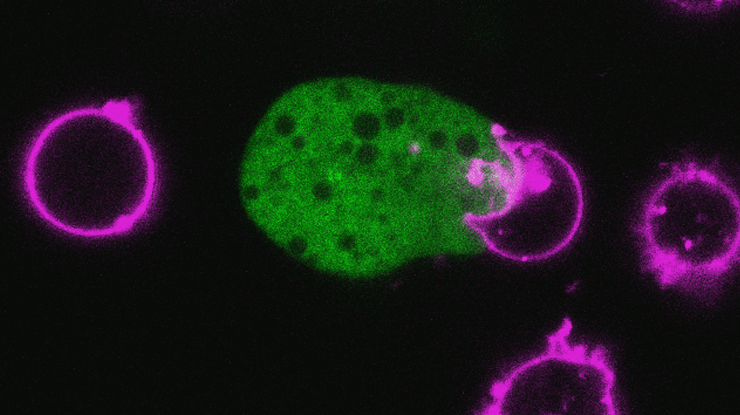 Not nice: A gut-eating amoeba (green) nibbles on a live human cell (purple) under the microscope. The parasite chews on the cell before killing and discarding it. Most of us have heard of the brain-eating amoeba. You know, the little guy that crops up in neti pots and backyard swimming holes every now and then. Now let me introduce you to its cousin: the gut-eating amoeba. This nasty critter can wreak havoc in your intestinal tract and cause a dreadful case of food poisoning that may last months or years. Now scientists have figured out how this amoeba makes us sick. Its tactics are more nefarious than we thought. The single-cell animal bites off tiny chunks of intestine, chews on them for a while and then spits them out, microbiologists report Wednesday in the journal Nature. That's right, folks, the little parasites — called Entamoeba histolytica — don't even have the courtesy to kill your cells before they take a bite. They don't even digest the parts they eat. Internist William Petri and his team at the University of Virginia caught all the treachery under the microscope. They filmed a bunch of the amoebae munching down on both gut and red blood cells. And they watched as the parasites used the chew-and-spit method to dismantle an intestinal wall. The team named the process trogocytosis, from the Greek trogo, or "to nibble." Pathogens have many options when it comes to upsetting our stomachs. E. coli and cholera secrete toxins. Other protozoa hoard all the nutrients or trigger inflammation — that's how the brain-eating amoeba damages tissue. So why does E. histolytica choose such a vicious and wasteful strategy? The microbiologists still don't know. But one hypothesis is that the nibbling "creates a more spacious environment" for the amoeba to invade the intestine, Petri and his team write. They hope their findings will lead to better drugs against E. histolytica one day. Unlike brain-eating amoebae, this parasite is common. It causes millions of cases of dysentery and colitis each year in tropical regions and developing countries.